Quota Busting Sales Teams in 30 Minutes or Less! YES, I want to save even more! Your secret, business building weapon is here. Join SalesTrainingwerks.com (‘The Werks’) and gain INSTANT ACCESS to an entire digital library of done-for-you nuggets of bite-sized sales training (30 minutes or less) to build a quota busting sales team. You get every training outline, template, guide, tip, trick and technique we use to build quota busting sales teams world-wide. Get INSTANT ACCESS to my entire collection of bite-sized nuggets of quality sales training that sticks! Get more out of your sales meetings! Sales managers asked and we delivered. We recently made a big decision! Take EVERYTHING we do and build a thriving done-for-you one stop training and leadership resource center. Every sales huddle energizer, amazing movie clips to motivate, 30 minute sales meeting outlines to boost skills, templates, cheat sheets, swipe files, expert messages, leadership tips and more. Everything’s in one place, easy for any sales manager to get to quickly. Build the skills of Top Performers – there’s The Perfect Months. 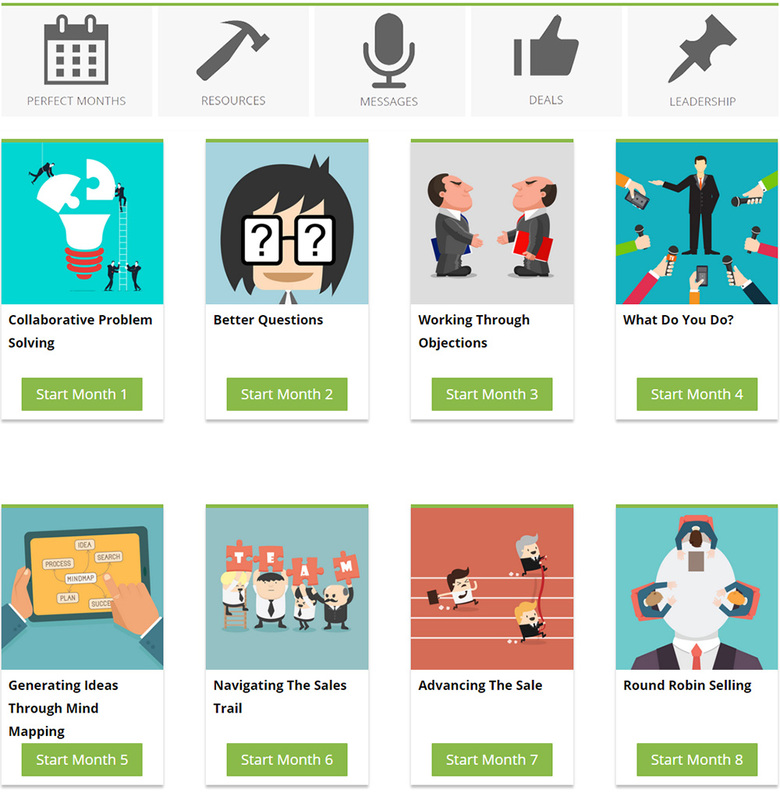 Each Perfect Month comes with an overview and outline for 2 Sales Huddle Energizers, 1 30 Minute Sales Meeting Skill Booster and 1 Amazing Movie Clip to Motivate Ambitious, Driven Sales Teams. Be the leader you want to be – there’s over 100 Leadership Tips in 8 categories – Leadership, Coaching, Retention, Goal Setting, Motivation, Problem Solving, Prospecting and Ways to Increase Sales to hone skills and lead. Learn best practices from leading edge training experts – there’s the Expert Messages. A series of interviews with Alice Kemper to start and coming soon more interviews from today’s leading edge sales and leadership experts. Ask the experts your most pressing questions – Monthly Office Hours with Alice Kemper is going to be live with open mike, and other invited experts. Here’s a chance to learn from the experts – it’s like a free consultation! In short, if you need to succeed in growing your sales team to meet sales quotas consistently, we will show, tell and give you everything you need to deliver it like a pro. Your investment… A YEARLY MEMBER…. only $379 and gain instant access to every Perfect Month. Or for $37 a month, gain instant access to ONE Perfect Month at a time. The Leadership Tips, Expert Messages, Office Hours and Training Deals are all instant and 24/7 access. There’s no contract to sign and if you don’t find your sales team has brought you in 3x your investment in the first 30 days… we will give you every penny back. You have an unconditional 30 day money back guarantee! I am prepared to tell you everything I know and help you take the fast-track to business success. If so, click the button below and we can get started right now! Your investment is completely protected by our 30 day money back guarantee! There’s no contract to sign and if you don’t find your sales team has brought you in 3 times your investment in the first 30 days… we will give you every penny back. You have an unconditional 30 day money back guarantee! As soon as I saw salestrainingwerks.com I knew I had exactly what would (1) save me hours of prep and (2) give me the gift of high quality sales training content. Building my team to meet our agressive quotas is my priority. Now I have the best tool for the sales training piece. We are at a revolutionary time with a workforce of five generations working side by side. salestrainingwerks.com solved my challenge of training this diverse workforce – satisfying each generation with these bite sized nuggets of top-notch sales training. Plus the invaluable resources for me to manage. The Leadership Tips are conversational, not confrontational, educational, relevant and actionable. It’s all a win-win for me and for my team.